Figure 1. 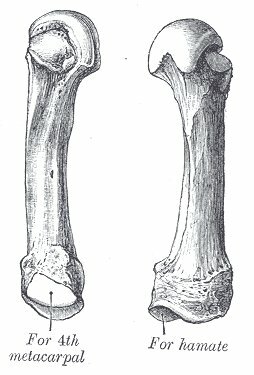 Bones of the hand, wrist, and upper arm. 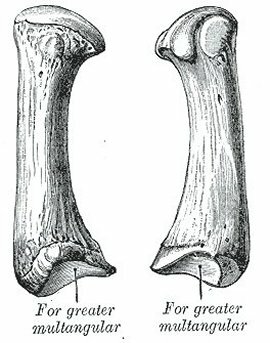 In humans and other primates, a metacarpal is any of the five long, cylindrical bones in the region of the palm of the hand (see Figure 1). 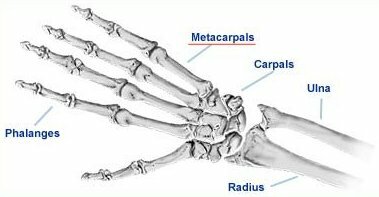 The metacarpals, known collectively as the metacarpus, run from the base of the wrist, where they articulate with the carpals (wrist bones), to the base of each finger, where they articulate with the phalanges (finger bones). On the palm, the metacarpals are covered by a thick layer of fascia (fibrous connective tissue); on the back of the hand, the metacarpals can be seen and felt through the skin. The heads of the metacarpals form the knuckles. In four-footed animals, the metacarpals are the bones of the forefoot. The number of metacarpals varies between species. In the pentadactyl limb (which has five digits) there are five, but this number is reduced in many species. The body is prismoid in form, and curved, so as to be convex in the longitudinal direction behind, concave in front. It presents three surfaces: medial, lateral, and dorsal. The medial and lateral surfaces are concave, for the attachment of the Interossei, and separated from one another by a prominent anterior ridge. The dorsal surface presents in its distal two-thirds a smooth, triangular, flattened area which is covered in the fresh state, by the tendons of the extensor muscles. This surface is bounded by two lines, which commence in small tubercles situated on either side of the digital extremity, and, passing upward, converge and meet some distance above the center of the bone and form a ridge which runs along the rest of the dorsal surface to the carpal extremity. This ridge separates two sloping surfaces for the attachment of the Interossei dorsales. To the tubercles on the digital extremities are attached the collateral ligaments of the metacarpophalangeal joints. The base is of a cuboidal form, and broader behind than in front: it articulates with the carpus, and with the adjoining metacarpal bones; its dorsal and volar surfaces are rough, for the attachment of ligaments. The head presents an oblong surface markedly convex from before backward, less so transversely, and flattened from side to side; it articulates with the proximal phalanx. It is broader, and extends farther upward, on the volar than on the dorsal aspect, and is longer in the anteroposterior than in the transverse diameter. On either side of the head is a tubercle for the attachment of the collateral ligament of the metacarpophalangeal joint. The dorsal surface, broad and flat, supports the Extensor tendons; the volar surface is grooved in the middle line for the passage of the flexor tendons, and marked on either side by an articular eminence continuous with the terminal articular surface. This is shorter and stouter than the others, diverges to a greater degree from the carpus, and its volar surface is directed toward the palm (see Figure 2). 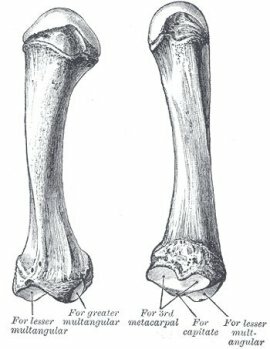 The body is flattened and broad on its dorsal surface, and does not present the ridge which is found on the other metacarpal bones; its volar surface is concave from above downward. On its radial border is inserted the Opponens pollicis; its ulnar border gives origin to the lateral head of the first Interosseus dorsalis. The base presents a concavo-convex surface, for articulation with the greater multangular; it has no facets on its sides, but on its radial side is a tubercle for the insertion of the Abductor pollicis longus. The head is less convex than those of the other metacarpal bones, and is broader from side to side than from before backward. On its volar surface are two articular eminences, of which the lateral is the larger, for the two sesamoid bones in the tendons of the Flexor pollicis brevis. 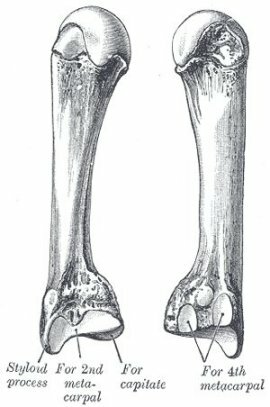 This is the longest, and its base the largest, of the four remaining bones (see Figure 3). Its base is prolonged upward and medialward, forming a prominent ridge. It presents four articular facets: three on the upper surface and one on the ulnar side. Of the facets on the upper surface the intermediate is the largest and is concave from side to side, convex from before backward for articulation with the lesser multangular; the lateral is small, flat and oval for articulation with the greater multangular; the medial, on the summit of the ridge, is long and narrow for articulation with the capitate. The facet on the ulnar side articulates with the third metacarpal. The Extensor carpi radialis longus is inserted on the dorsal surface and the Flexor carpi radialis on the volar surface of the base. This is a little smaller than the second (see Figure 4). The dorsal aspect of its base presents on its radial side a pyramidal eminence, the styloid process, which extends upward behind the capitate; immediately distal to this is a rough surface for the attachment of the Extensor carpi radialis brevis. The carpal articular facet is concave behind, flat in front, and articulates with the capitate. On the radial side is a smooth, concave facet for articulation with the second metacarpal, and on the ulnar side two small oval facets for the fourth metacarpal. This is shorter and smaller than the third (see Figure 5). The base is small and quadrilateral; its superior surface presents two facets, a large one medially for articulation with the hamate, and a small one laterally for the capitate. On the radial side are two oval facets, for articulation with the third metacarpal; and on the ulnar side a single concave facet, for the fifth metacarpal. This presents on its base one facet on its superior surface, which is concavo-convex and articulates with the hamate, and one on its radial side, which articulates with the fourth metacarpal (see Figure 6). On its ulnar side is a prominent tubercle for the insertion of the tendon of the Extensor carpi ulnaris. The dorsal surface of the body is divided by an oblique ridge, which extends from near the ulnar side of the base to the radial side of the head. The lateral part of this surface serves for the attachment of the fourth Interosseus dorsalis; the medial part is smooth, triangular, and covered by the Extensor tendons of the little finger. 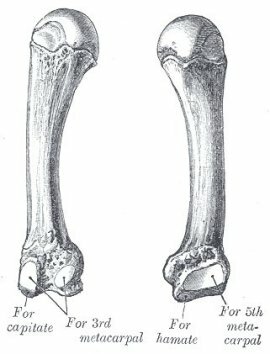 Besides their phalangeal articulations, the metacarpal bones articulate as follows: the first with the greater multangular; the second with the greater multangular, lesser multangular, capitate and third metacarpal; the third with the capitate and second and fourth metacarpals; the fourth with the capitate, hamate, and third and fifth metacarpals; and the fifth with the hamate and fourth metacarpal.